A lovely gift for Valentine day, Mothers Day, Christmas, Wedding, Anniversary, Graduation, Birthday, Bridesmaids, Prom and Formal Events. The wholesale product of vacuum-packed cultured pearl oysters is highly praised and appreciated by the consuming public. Each oyster includes a 6-7mm cultured pearl with AAA quality in vacuum packing. The list price is for 100pcs. The oysters with the cultured pearls of bright luster in special packing way are very suitable for your family, friends, lovers, or even yourself as a gift. We have reliable quality and reputation. Pick this hot selling product and you won't be disappointed. This listing is for 100pcs Round Akoya Cultured Pearl in Oyster 6-7mm with gold color. It is our new product. Hope you like it. Our cultured pearl oyster is directly cultured from our own farm which is more than 10 years business in China. 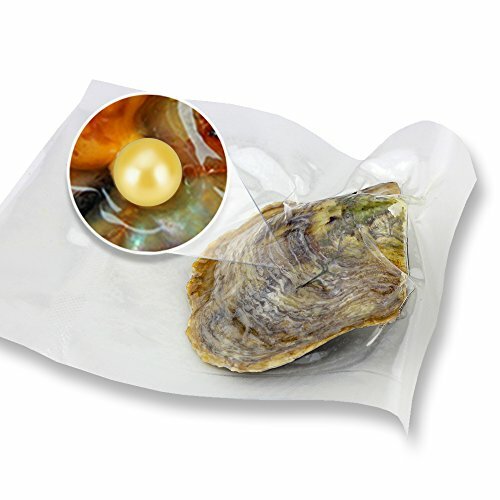 Every cultured pearl oyster is packed in individual vacuum bag. This listing is for 100pcs Round Akoya Cultured Pearl in Oysters 6-7mm with gold color. It is our new product. If you have any questions about this product by NY Jewelry, contact us by completing and submitting the form below. If you are looking for a specif part number, please include it with your message. Moissanite Marquis 9.0 x 4.5 mm .70 carats 57 facets FREE EXPRESS SHIPPING UPGRADE, SPECIAL ORDER SIZE. Takes 1-2 Weeks to ship. Cannot be returned.